Our Featured Staff Member of the Month is Saskia Felderhof! Saskia is one of our stablehand extraordinaires and we have been fortunate to have Saskia as part of the Lancers team for over a year. Saskia starts her day at the barn at 6:30am and as a morning person, she finds this early start easy. This also means that her job is done by the time most riders get to the stables each day. Even though riders might not see her on a daily basis, we hope that the whole Lancer community is very aware of Saskia's presence, not only because she takes such great care of the horses but because she is a wonderful person who genuinely believes in the uniqueness of the Lancer community. Saskia is a very experienced horseperson and we never doubt that our horses are in the best of hands. Not only did Saskia used to have her own horses (she owned three horses in her past riding career), but she also competed in the low hunters and started and trained her last horse who was pretty green. Her other jobs in the horse industry have included an A-circuit groom and jobs managing barns. Managing one barn with over forty hours came with tones of responsibility, especially as a show barn, she had to work to keep both the horses and their owners happy. "That's why I am such a perfectionist", she explained. At Lancers, Saskia gets to focus on the overall horse care. This includes cleaning stalls, giving the horses fresh water, hay, and grain, and also administering any medications when necessary and caring for injuries and wounds. She ensures the horses get turn out time and ensures the stables has all the necessary supplies including hay, shavings, medicine, and medical products. In all, Saskia is tasked with keeping all the Lancer horses going and keeping them in tip-top spirt and health! When asked she enjoys most about Lancers, Saskia was quick to proclaim that she is very happy to be partnered with such a great co-worker (Elizabeth) and that they work really well as a team. She definitely also enjoys working with the horses. If she *really* had to choose a favourite horse it would be Reese because he is so sweet. 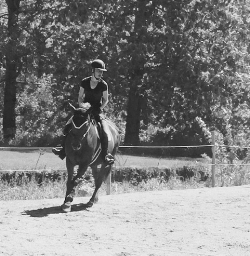 She elaborated, "he tries to be such a good horse. He is very different from other horses as he just wants to please. He is very polite and when he has been feel sick, he is the perfect patient and he is always just so gentle". While all her jobs have involved horses, Saskia noted that those jobs have been about working with horses in rural areas. Being downtown in a historic building with so many traditions is a very unique working experience according to Saskia. On this, Saskia explained that Lancers is so different from other places in the way that the Lancer community all pulls together to run it: "there are so many hands involved to make this place work and that's because it is a non-profit rather than a privately owned stable". Something else that Saskia notices about Lancers is that people start riding here and stay for a long, long time. She is amazed by some of the adult riders who have been here for 15-20 years which says a lot about the organisation. She also finds it endearing that junior riders who start in the beginner course stay on and then move up into the J-rides when they reach university. That longevity is something very special to Lancers. Since Saskia is always the first person at the barn on weekdays, we just had to ask her about fun facts about Lancers that many people wouldn't know. According to her, the best time is in the morning when all the horses are fed their breakfast and they are all happily munching on their hay and grain by 7am. "I really like that alone time in the morning with them", she added. The horses evidently love their morning time with Saskia too. In fact, Saskia has noticed that Sarge always listens for her to get out of her car in the morning. He whinnies and then the moment she opens the barn door she is greeted by 26 other whinnies and neighs! "It is a nice greeting party every morning", she quipped! (Feeding oneself or breakfast to a family everyday by 7am can be enough for most of us let alone 27 big mouths)! One morning Saskia came into stables (which were pitch black without the lights on) and when she flicked on the lights who did she see but Sarge standing right in front of Jakey's stall! Sarge is such a big horse and is very clever so if you don't double clip his door, he knows how to open it himself! The sight was quite a surprise to Saskia as Sarge lives on the other side of the stables but it also led her to wonder...what other mischief do they get up to at night? Hay throwing? Bucket knocking? Late night chats? It is an endearing reminder that our Lancer horses sure do have their own personalities and our community would simply not exist without them! Our Featured Horse of the Month is Punkin!